Adrenaline amping family fun awaits on board the Liberty of the Seas, one of the Royal Caribbean's classic ships. Most of the cabins have floor-to-ceiling windows that offer spectacular views of the Caribbean Sea and its beautiful shores. 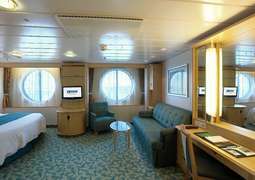 The cabins themselves are comfortably designed and are fitted with some of the most modern amenities at sea. 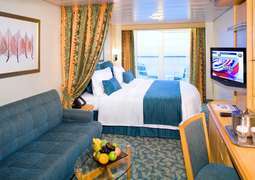 Enjoy the nightly turn down service and a daily stateroom attendant, both making your cruise holiday that little bit more special. The days between destinations will never be boring on board the Liberty of the Seas. There are plenty of water fun options for the whole family: the famous 'Flowrider' and the high-speed waterslides at the 'Perfect Sotrm', the 'Splashway Bay' aqua park and the 'Tidal Wave' boomerang slide. Nights will also be jam-packed with things to do: watch all the latest releases on the poolside screen, listen to the live orchestra or snoop around the ship on an all access tour. Hungry after all that action? No problem, the Liberty of the Seas' chefs are there to satisfy even the pickiest of eaters with their world-class freshly made offerings. 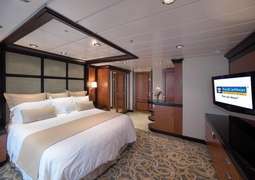 You can choose from comfortable inner cabins, outer cabins with or without a balcony, and luxurious suites. 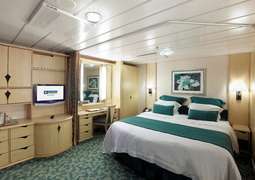 No matter what you decide, all cabins aboard the Liberty of the Seas are furnished to the highest of standards. The chefs of the different theme and specialty restaurants are pleased to welcome you aboard the Liberty of the Seas. You can look forward to Italian cuisine at the Portofino restaurant and tasty steaks at the Chops Grille. Taste fine wines at the Vintages wine bar, which offers a great selection of wines from the best vineyards around the world. There is plenty to do on board the Liberty of the Seas; enjoy performances in the theatre or at the ice rink, dance at parties in the open-air night club or try your luck in the casino—this great variety ensures fun for everyone. Work up a sweat in the gymnasium or on the athletic track. 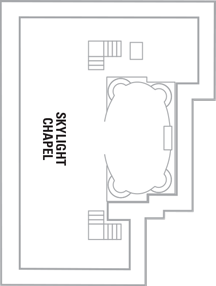 A climbing wall, miniature golf course and a golf simulator are also available. The day spa is the ideal place to enjoy a massage, take a yoga lesson and completely relax and unwind. The Royal Promenade houses plenty of shops where you can find a great variety of goods, including jewellery, cosmetics and clothing.